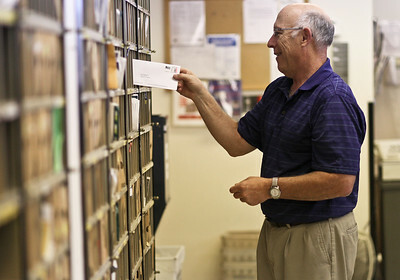 Josh Peckler - Jpeckler@shawmedia.com Dan Guttschow sorts mail at the Hebron Post Office Tuesday, July 31, 2012 on his last day before retiring after 29 years as the Postmaster at the Hebron Post Office. 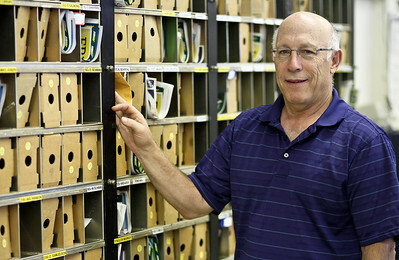 Josh Peckler - Jpeckler@shawmedia.com Dan Guttschow will be retiring after 29 years as the Postmaster at the Hebron Post Office. Josh Peckler - Jpeckler@shawmedia.com Dan Guttschow gets a handshake from John Horton on Guttschow's last day before retiring as postmaster of the Hebron Post Office. Horton will be stepping in as the new Postmaster. 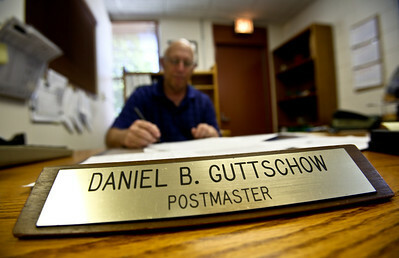 Josh Peckler - Jpeckler@shawmedia.com Dan Guttschow fills out paperwork at his desk at the Hebron Post Office Tuesday, July 31, 2012 on his last day before retiring after 29 years as the Postmaster at the Hebron Post Office. 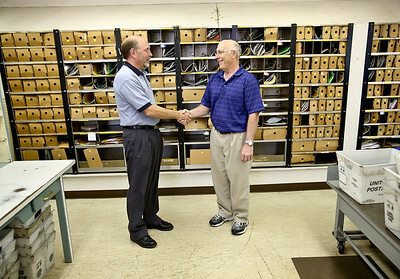 Dan Guttschow gets a handshake from John Horton on Guttschow's last day before retiring as postmaster of the Hebron Post Office. Horton will be stepping in as the new Postmaster.